The Tagus River flows from east to west in the Lisboa region, widening as it approaches to create the verdant plain called Lezir­-a. While Lisbon is a bustling capital, the region also has more to offer in terms of quaint, rural attractions. The nearby towns of Abrantes, Constãncia, Vila Nova da Barquinha and Santarém have deeply-rooted cultural traditions, and it's a real treat for visitors to see horsemen clad in traditional costume rounding up cattle in the fertile pastures. Near the capital is the romantic town of Sintra. Once home to the Portuguese aristocracy, the town has preserved all their marvellous palaces and mansions, and provides visitors with a perspective into the decadent elegance of Portugal's glorious past. On Lisboa's Atlantic coast, high cliffs give way to white sand beaches backed by lagoons. Cabo da Roca, Europe's westernmost point, is here. The charming coastal villages of Sesimbra, Peniche, and Nazaré are noteworthy for their colourful local fishing fleets. UNESCO heritage sites are to be found in the towns of Alcobaèa (which has a large, medieval monastery), Tomar, and Batalha. Aside from these, there are also some great sandy beaches to enjoy at Estoril and Cascais. 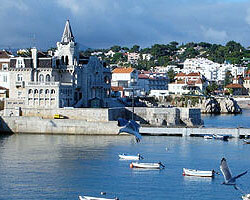 Another city, Sétubal, is the country's third largest port. Industry here is experiencing a downturn, though its proximity to the beaches and the pine-covered splendour of the ArrabÃ­da Natural Park provides an opportunity for tourism to flourish. The city is located at the Sado River's mouth, and the Natural Reserve of the Sado Estuary with its diverse collection of wildlife also draws in many visitors. The area has mild winter temperatures and balmy summer weather.